Construction has begun on the first phase of River City, the first private sector development project in the West Don Lands. 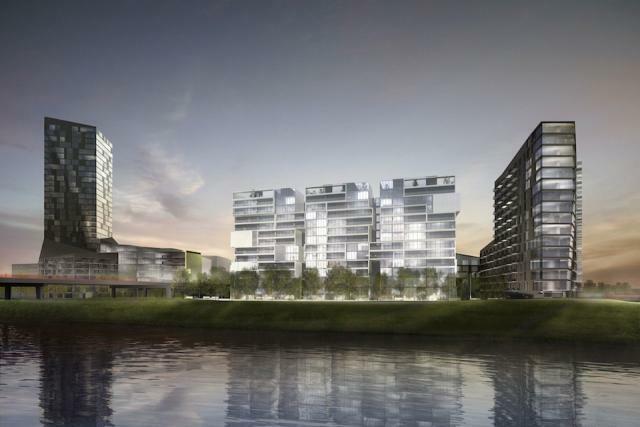 Phase One of the $300 million project by developer Urban Capital includes approximately 350 residential units in two buildings, one along King Street East and one on the east side of River Street. The second phase includes 248 units contained in a single building structured to appear as three connected 12-storey mini towers. Phase two’s sleek white exterior is designed to be a dramatic contrast to the edgy dark exteriors of buildings in the project’s first phase. River City has a range of beautifully designed suites and amenities that include stunning landscaping throughout the complex, an outdoor pool and dining area, a two-storey glass “lightbox” lounge and party room, two fully-equipped exercise rooms and a furnished guest suite. River City is working towards achieving the first LEED Gold carbon-neutral residential development in Canada, and includes a series of high performance, energy efficient buildings with many sustainable features designed for occupant comfort. Phase two will go on sale in November with occupancy anticipated for 2014. Toronto's Waterfront One of "21 Smart Communities of the Year"